We offer tailor-made and off-the-shelf workshops to fit the needs of each client. All of our workshops include a combination of classroom lectures and exercises, which are reinforced with field tours and activities. The workshops include real-world examples of stream assessment and restoration applications from a wide range of conditions, including: rural and urban watersheds, steep and low gradient streams, sand and gravel bed material, and others. This course is for individuals who have taken the Stream Functions Pyramid Workshop and experienced practitioners who want further training on how to collect and enter field data into the Stream Quantification Tool (SQT). Three out of five full days will be spent collecting field data using both the rapid and detailed methods. Two days (plus an evening) will be spent processing the field data, entering it into the SQT, and playing with functional lift and loss scenarios. This course provides participants with training on how to use the Natural Channel Design Review Checklist. The course starts with an overview of stream processes, channel stability and function, restoration potential, and natural channel design techniques. Exercises are used to reinforce the concepts. From there, the participants are introduced to the Checklist and use it to review two case studies. A field trip is taken to demonstrate measurement techniques and to critique a local restoration project (if available). Participants will leave the workshop prepared to apply the Checklist to future designs submitted for their review, or as an aid to help determine the tasks required to complete a natural channel design. To see our brochure, click here. 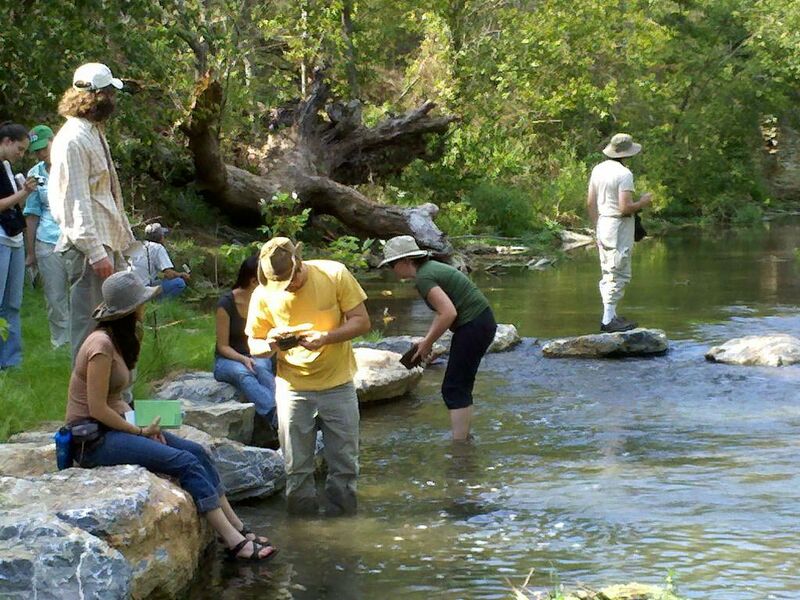 This course is for individuals who have taken the Stream Functions Pyramid Workshop and want further training on how to collect and enter field data into the Stream Quantification Tool (SQT). Three out of five full days will be spent collecting field data using both the rapid and detailed methods. One and a half days (plus an evening) will be spent processing the field data, entering it into the SQT, and playing with functional lift and loss scenarios. A review of the SQT and key metrics will be provided during the first half of day one. This is an intense course. It is designed for scientists and engineers who plan to use the SQT on future projects. Most days will be spent in the field regardless of weather conditions (unless the conditions are unsafe). One evening will be spent processing data. And the course doesn't end until 5:00p on Friday. If you've had the pyramid course and like adventure, this course is for you. Here is a general overview of the week. Day 4 - Detailed Assessment of a Restored Site. Process data and enter into SQT. Day 5 - Rapid Assessment of a Restored Site. Process data and enter into SQT. The workshop provides intensive instruction on watershed condition assessments, baseline functional assessment based on the Stream Functions Pyramid, and the determination of restoration potential. The workshop is a mix of classroom lectures and field work on the project reach. In addition to the project reach, the workshop includes field work at gage stations and/or reference sites to partially develop watershed-specific regional curves, reference reach ratios and design criteria. The information generated by the workshop can be used to complete the design criteria, which is used to develop a natural channel design in the second workshop. The workshop provides intensive instruction on applying the natural channel design process to the project stream reach. The results from the function‐based assessment, restoration potential, and design criteria developed in the Stream Assessment and Restoration Potential Workshop are required to complete the design. Optional post‐workshop services include preparation of plan sheets and specifications that can be used to prepare final construction documents. During the construction phase of the project, this workshop will provide instruction on key construction observation and inspection techniques. Participants will learn how to lay out in-stream structures, inspect channel dimensions, and affectively work with the contractor. An optional component includes working with local contractors to construct a natural channel design. This workshop uses past demonstration projects to assess project performance and develop adaptive management plans. The workshop builds on the results of past off-the-shelf workshops, including the assessment, design, and construction workshops. Participants must have taken these three workshops in order to take this workshop. The monitoring will include cross sections, longitudinal profiles, bed material samples, vegetation assessments, and possibly macroinvertebrate and fish sampling. The data will be entered into spreadsheets to determine stability and functional condition trends since construction. Special focus will be given to determining if channel adjustments are within the natural range of variability or if adaptive management/maintenance is needed. Developing geomorphic assessment and natural channel design training/mentoring programs for private engineering and consulting firms, based on the unique needs of the company. Assisting federal, state, and local agencies with incorporating the Stream Functions Pyramid and Framework into their Standard Operating Procedure. Modifying the Natural Channel Design Review Checklist to fit the client’s program needs/requirements.